Swig Savvy's stainless steel water bottles is the best option for taking along hot or cold drinks! Our bottles are made of high-quality food-grade 18/8 stainless steel that will protect your liquids, keeping your coffee, tea or soup hot for up to 12 hours, and your refreshing cool drinks will stay cold for up to 24 hours. It is free of BPA and phthalates and the heavy-duty interior coating repels lingering flavors to enable constant reuse without any after tastes. It also features a wide opening for easy refills and maintenance. 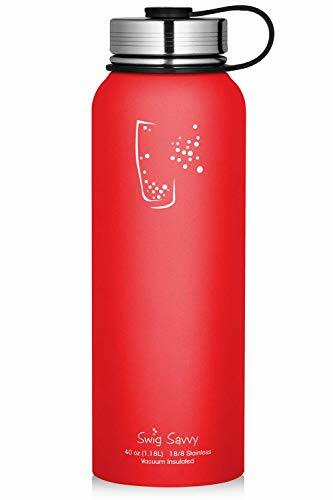 ☆ THE PERFECT SOLUTION FOR YOUR HOT & COLD BOTTLING NEEDS - Swig Savvy's vacuum-insulated water bottles are made of high-quality food-grade 18/8 stainless steel, protecting the quality and temperature of the stored liquids. Free of BPA and phthalates, the heavy-duty interior coating repels lingering flavors to enable constant reuse without any after-tastes. ☆ KEEP LIQUIDS HOT FOR UP TO 12 HOURS: You can now take your coffee, hot drink or even hot soup with you to and enjoy it at temperatures you expect. Send them to school with your kids to give your child a taste of home and a nutritious, filling warm drink or meal. ☆ SWEAT-FREE DOUBLE-WALLED STAINLESS STEEL- The bottle will keep its contents cool such as freezing cold fluids or ice cold for up to 24 hours. Perfect for staying hydrated when hiking, travelling, during sports and workouts while minimizing condensation! ☆ POWDER-COATED, DURABLE FINISH -Our bottles have a stylish look and durable exterior that's designed to last. It features a practical wide-opening design for easy holding, refilling, pouring and drinking. ☆ STAINLESS STEEL LEAK-PROOF LID - Unlike other companies, Swig Savvy's bottle features an stainless-steel lid so your liquids won't come in contact with any plastics. The air-tight seal lets you safely take a refreshingly cold or invigorating warm drink with you while traveling, at the gym or wherever else you go! If you have any questions about this product by SWIG SAVVY, contact us by completing and submitting the form below. If you are looking for a specif part number, please include it with your message.